Satya Scainetti's necklaces help you align your actions with your body's seven energy centers. Imagine for a moment: The chakras, or seven energy centers of your body, were filled with glistening gemstones. You'd be a walking rainbow. Satya Scainetti's seven unique pendants play on this idea. She handcrafts each from gold-dipped brass, giving them their own special iteration of a lotus with a gemstone. 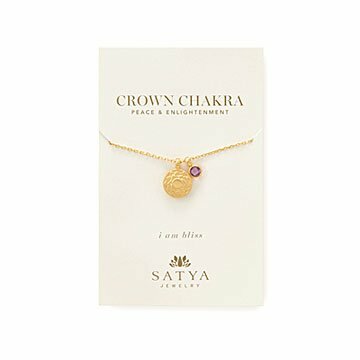 The crown chakra (sahasrara, for example, has a purple amethyst charm), and the heart chakra (anahata has a vibrnat green onyx stone). Pick your favorite to help you align with a special intention each day, or give one to a friend who could use a reminder to stay balanced. Handmade in India. Pendant: .5" Dia Chain: 18"
Love how delicate and pretty this necklace makes me feel.